Summer is a time for fun, adventure and excitement – for both flock owners and backyard flocks. As the summer sun hits its peak, flock owners can apply their own summer health practices to better care for their backyard poultry. The summertime essentials are similar for both humans and backyard flocks: stay hydrated, protect yourself from the heat and maintain a complete and balanced diet. As humans, our habits change in the summer. We adapt to stay comfortable. By providing our backyard chickens the tools they need, they can also adapt and enjoy the sunshine. Many people don’t realize that birds are unable to sweat. To cool down, they open their beaks and pant or spread their wings away from their bodies. If these cooling strategies are not enough, birds are more likely to become lethargic and may stop eating feed, which can lead to subsequent health challenges and reduced egg production. We want to avoid these signs of heat stress by preventing problems before they begin. With the right care, birds will maintain their routines of foraging, pecking and chattering throughout the day. Staying hydrated in the summer is a clear choice for humans. As temperatures rise, a good rule for people to follow is to calculate half your body weight in pounds and drink the equivalent number of ounces of water. For our backyard chickens, the practice should be similar: Clean, cool water is essential. Follow the general rule of providing 500 milliliters of fresh water per bird per day. This equates to one gallon for every seven adult birds. Drinking water helps cool birds’ body temperatures. In high temperatures, chickens will drink up to twice as much water as during temperate conditions. If chickens do not have quality water, they are less likely to eat or lay eggs. Provide extra waterers so each bird has access at all times. Place waterers in a shaded area to help keep the water cool and the coop dry. Offer fresh, cool water in the morning and evening. Freeze water in a storage container. Place the resulting ice in the waterer in the morning to keep the water cool. Place marbles in waterers to prevent splashing. Wash waterers weekly with a mixture of 10 percent bleach and 90 percent water. Rinse thoroughly. Think of your most recent day in the sun. You likely incorporated a few cooling practices to maintain an adequate body temperature and avoid heat stress. A consistent body temperature is equally important for backyard flocks. If a bird’s body temperature climbs, it can cause a lasting strain. Create a cool and comfortable environment for the flock to enjoy. Provide shade by placing roofs on the run or shade cloths over the door. Add misters outside of the chicken coop that spray onto the roof or shade cover for evaporative cooling. Create adequate air flow inside the coop. Open all windows and roof vents to allow hot air and ammonia to escape. Add a small fan for air circulation. Swap solid coop doors with screen doors and keep lights off during the day. Reduce bedding to two inches or less to avoid heat being trapped. 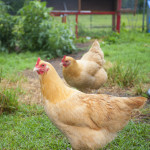 Provide a peat moss dust bath for backyard chickens to play in. If mites are a concern, switch to a mix of 90 percent peat moss, 10 percent diatomaceous earth. Avoid overcrowding by providing at least 4 square feet of indoor space and 5-10 square feet of outdoor space per bird. It can be argued that fresh-from-the-garden fruits and vegetables, summertime snacks and potluck picnics are true summer highlights. But, no matter the treat, it’s important to maintain a balance. A balanced diet is very important for our backyard poultry as well. Summer is the perfect time to spend in the backyard with the flock and give them a few indulgent snacks, but don’t forget the 90/10 rule: 90 percent complete feed and 10 percent treats or snacks. Give fresh complete feed in the morning and evening in a shaded area, offering treats only after the flock has finished its complete feed. Offer cold or frozen fruits and vegetables as a summertime treat. Provide special treats such as Purina® Flock Block® or Purina® Scratch Grains as a complement to a complete feed. Treats formulated specifically for birds can provide beneficial nutrients while keeping birds active. Offer free-choice grit if your flock is fed whole grains, seeds or other non-commercial feedstuffs. Purina® Chick or Poultry Gritcan be fed separately or mixed with your flock’s grain diet at a rate of 1 pound of grit per 20 pounds of feed. Offer oyster shell to help maintain calcium intake and eggshell quality when birds may be eating less due to heat. Provide at least six inches of feeder space per bird. Summer heat tends to reduce feed intake, so the complete feed should be the first dietary priority. When birds have a balanced diet, plenty of water and a cool, comfortable environment, they are better able to remain healthy and productive and enjoy a fun and peaceful backyard summer. This entry was posted on Monday, June 13th, 2016 at 10:07 am	and is filed under Chicks, News & Updates. You can follow any responses to this entry through the RSS 2.0 feed. Both comments and pings are currently closed.